Glenn Hughes had been planning his first solo album for a year prior to the break-up of Deep Purple in 1976. He was helped in the recording process by old Trapeze band mates Mel Galley, Dave Holland, and sometime keyboard player Terry Rowley, after having guested on their latest album 'Trapeze', recorded in September 1975. Once the initial work was done, Glenn joined a specially reformed version of Trapeze for a US tour, airing tracks from his solo album. 'Play Me Out' was finished on his return to the UK in the autumn of 1976 and released the next year, although only in Germany. It was eventually released in the UK during 1978, disappearing sharpish into a punk and new-wave vacuum. There was no live promotion. Glenn returned to live in Los Angeles, where his life continued to sink into substance abuse punctuated by a frustrating series of musical projects which usually held a lot of promise before suddenly collapsing. 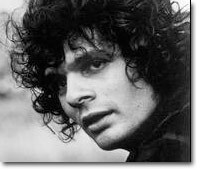 Sometime during 1978 keyboard player Al Kooper began work on a new group which he hoped to call The Hollywood Horns. Richie Hayward (from Little Feat) was to handle drums, first session musician Elliot Randall and then Doobie Brothers' Jeff 'Skunk' Baxter were earmarked for the guitar spot, Neil Stubenhaus on bass, with Glenn Hughes completing the line-up on vocals. With Hayward sidelined by a motorcycle accident, session players had to be brought in for the initial recording work, which involved a number of 'warm-up' cover versions, including a Rolling Stones medley given the full contemporary disco treatment. The project folded before new material written by Kooper, Baxter and Hayward could be laid down. Possibly to try and recoup losses, record label Casablanca released the covers as 'Four On The Floor'. An unhappy Hughes asked for his name to be removed from the credits. In 1979 Glenn decided against joining guitarist Gary Moore's G-Force, where he would have played alongside former Ian Gillan Band drummer Mark Nauseef. Other three-pieces also failed to come to fruition. In 1979 a proposed team-up between Glenn, ex Tommy Bolin Band drummer Narada Michael Walden, and guitarist Ray Gomez hit the rocks. 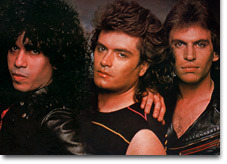 In 1980 Glenn and Gomez tried again, unsuccessfully, before Glenn finally approached guitarist Pat Thrall in April 1981. 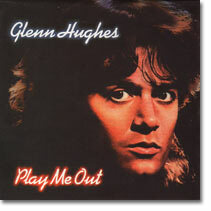 Glenn Hughes re-emerged in the public spotlight during 1982 with one of his most highly rated post-Deep Purple projects. Hughes Thrall involved Glenn and guitarist Pat 'Thrasher' Thrall, Glenn having got in touch soon after Thrall's departure from The Pat Travers Band. After nearly a year of rehearsal and drummer auditions, their eponymous debut album came out in the USA to positive reviews, with a belated UK release following in January 1983 (by which time many fans had shelled out on imports). The album was not the commercial success which the band had been lead to expect, and the supporting US shows (some opening for Santana) were later described by Hughes as 'a cocaine tour'. Drummers Frank Banali, Gary Ferguson and Gary Mallaber played on the album, and then Ozzy Osbourne's drummer Tommy Aldridge stepped in for the live shows. In interviews they sounded in good spirits, and the stories of a bust up which emerged soon after came as something of a surprise. They had been due to make a second album in February 1983, and follow this with dates in Japan and Australia in April / May. British festival dates were also being arranged for late summer. 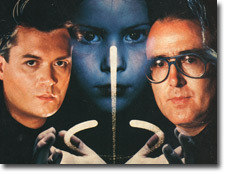 The two gave it a second chance in 1984, starting off by recording tracks for the movie Ghostbusters. The material was eventually turned down in favour of Ray Parker's more 'poppy' offer, but the project was seen as a launch pad for a new Hughes Thrall album and a tour of Europe. However they split before the end of the year, by which time Glenn was involved with other recording commitments and looking to reform Trapeze. Hughes Thrall II was left unfinished and has since been the cause of much speculation. One further brief reunion in 1987 provided the track 'City Of Crime' for the movie Dragnet. During the 1984 Hughes Thrall reunion Glenn also began recording for Tom Galley's Phenomena project, which was soon followed by requests to work with Gary Moore and to reform Trapeze. Phenomena was the brainchild of Mel Galley's brother Tom. 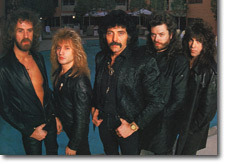 Originally announced as a movie concept (which in the end did not get beyond the scripting stage), Glenn began laying down vocals for the 'soundtrack' in April 1984, joining a studio band which included Whitesnake players Cozy Powell, Neil Murray and Richard Bailey, plus Mel Galley (who had just been ousted from Whitesnake), Don Airey, Ted McKenna (MSG), and John Thomas (Budgie). In the end the project did not get beyond the album, which appeared in June 1985. Plans for a live gig were dropped when the LP bombed. One contemporary reviewer expressed his disappointment after having raved about the initial demos, claiming that the album had been ruined by having extra synth work "poured into every orifice". Record label Bronze later went bust. There was a follow-up album in November 1987, on which Glenn sang three tracks. During the recording of Phenomena, an idea to reform Trapeze took shape and had gone as far as rehearsals involving Glenn, Mel Galley, and fellow Phenomena performers Don Airey and Ted McKenna. At the same time Gary Moore was working on his new album in the same studio as Phenomena, and persuaded Glenn to sing on two tracks, followed by an offer to join his band full time. In January 1985 Glenn accepted Moore's offer, and the Trapeze reunion was shelved. 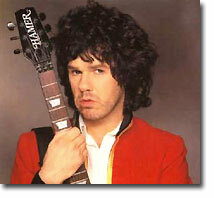 He added vocals and bass parts to Gary Moore's 'Run For Cover' album, which was scheduled for release in September 1985, preceded by a European tour. In the end, as usual, things did not work out as intended. Glenn left Moore's band amid scenes of acrimony, due to his drug problems. Glenn's continuing involvement with promoting Phenomena was another issue. Moore's annoyance was further stoked by the inclusion of Hughes Thrall II out-take 'Still The Night', which he had wanted on his own album. Prior to Black Sabbath's 1985 Live Aid reunion with Ozzy Osbourne, moves had been under way to bring the band back together on a full time basis. While waiting for a break in Osbourne's solo career, Tony Iommi decided to record a solo album. By the time of Live Aid he had completed the backing tracks with the help of Black Sabbath keyboard player Geoff Nicholls, and two members of Lita Ford's band. Glenn Hughes was then brought in to provide the vocals. Iommi had by now taken ownership of the Black Sabbath name, and the resulting album 'Seventh Star' was credited to 'Black Sabbath featuring Tony Iommi'. It was released to generally positive reviews in 1986, with Glenn in particular putting in a fine performance. Sadly it all fell apart on the road, with Glenn being replaced by vocalist Ray Gillen after a mere six shows. His voice suffered following an injury received in a fight with Sabbath's production manager, and he was also in no physical shape to complete the tour. Glenn's short tenure in Sabbath was not the end of his work with Tony Iommi. Ten years later they recorded again, with the results bootlegged as 'Eighth Star' before being given an official release in 2005 as 'The DEP Sessions'. This in turn was followed by a joint album project 'Fused' which appeared in 2006. 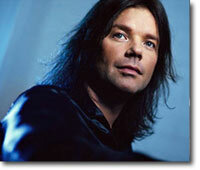 Guitarist John Norum left the Swedish band Europe at the end of 1986. Glenn Hughes happened to remark to photographer (and DPAS member) Mike Johansson how much he liked Norum's work. Johansson knew that Norum had been a long standing Glenn Hughes fan and put the two in touch. The resulting get together in March 1987 produced plans to begin work on a Hughes/Norum project almost at once and before long Glenn went out to Sweden to lay the ground work. On May 21st 1988 the duo made their world debut on Swedish TV as guest band during a national rock contest (which had been won by Europe back in 1982).. A month later Glenn was asked to leave Norum's band because while everyone thought he'd got his habits under control, this wasn't in fact the case. In 1991 Glenn returned to contribute vocals to John Norum's solo album 'Face The Truth', which was released in Sweden in 1992. The album contained another reworking of "Still The Night". Very funky post-Deep Purple solo album, backed by members of Trapeze. The RPM CD remaster had five bonus tracks including unreleased single 'Smile'. Hollywood Horns studio sessions. Released on CD together with Play Me Out by Connoisseur Records, 1990. Deleted. Rare. Excellent album, regarded as one of Glenn's finest. Remastered in 2008 with two bonus tracks from the unfinished second album. Slightly dodgy 'concept' album, but with excellent vocals throughout from Glenn. Now available with Phenomena II & III as part of a 3xCD set. Gary Moore solo album. Glenn appears on four tracks (singing and playing bass on three). 'Black Sabbath featuring Tony Iommi'. Glenn sings throughout; great performances. Follow-up to 1985 concept album, but minus the concept. Glenn sings on three tracks. Now available with Phenomena I & III as part of a 3xCD set. Apart from infrequent sessions as a backing vocalist, Glenn sang on the 'City Of Crime' track (along with Pat Thrall) for the soundtrack of the movie Dragnet in 1987.